I have bought several dozens of special tee cookies. They ar ..
Our gourmet cookie gift baskets are filled to the brim with delicious fresh-baked cookies to delight just about anyone! These unique gift baskets are perfect for any holiday and make great Valentines Day Gifts, Mother's Day Gifts, and Christmas Gifts. Plus, they are wonderful for special occasions and make fantastic Thank You Gifts, Birthday Gifts, Get Well Gifts and Corporate Gifts. Who said you need a reason to send someone a gift? This item is perfect when you want to brighten someone's day and make them feel special. 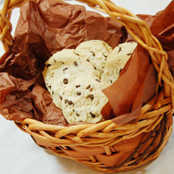 This basket is perfect for any occasion or gift and features a dozen of our gourmet cookies. Two dozen of our delicious cookies hilight this basket sure to make any occasion one to remember! WOW! This fantastic basket features THREE DOZEN of our gourmet cookies. Perfect to turn any occasion into a party. Need a great gift in a hurry? 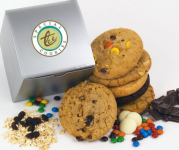 How about instantly by email with a Special Tee Cookies gift certificate!